Sistas’ Place, 456 Nostrand Avenue @ Jefferson Ave.
As we enter the sphere of President Trump, we must make a thoroughgoing analysis of the choices that lay before us. Mr. Trump’s relationship with white supremacist and anti-labor corporate leaders in and out of his incoming administration has given many people pause. “The Choice” campaign led by the December 12th Movement, has held many community forums and rallies geared toward Black self-determination and a plebiscite [referendum] on our national status. 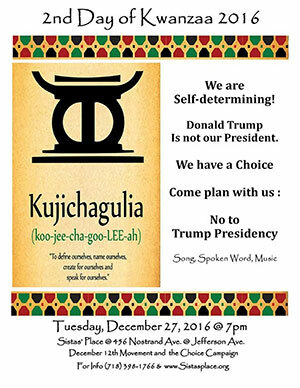 On the 2nd day of Kwanzaa, Kujichagulia, meaning Self Determination; a special event “A Nation Within A Nation” celebrating Black people’s human right to self-determination, will be held on December 27, 2016, at 7 PM at Sistas’ Place at 456 Nostrand Avenue [corner of Jefferson Ave] Brooklyn NY. A forum held in Brooklyn last week intensified The Choice campaign. “The question is ‘Who are we?’ declared Omowale Clay. “Here we are, over 40 million Africans in the United States, yet we are not part of the United States. When we walk outside we see the fundamental reality. We are left out of the process of defining who we are. If you can’t define it, then you are a victim of someone else’s definition,”. Clay said, “The one thing we can control is our minds. If we look at our history, many of our greatest leaders taught us we are in fact, a nation within a nation. At the First Pan African Conference in London in July 1900, W.E.B. Dubois issued an ‘Address to the Nations of the World’ which included the declaration ‘The problem of the 20th Century is the problem of the colour-line’. For more information call the December 12th Movement at (718) 398-1766.